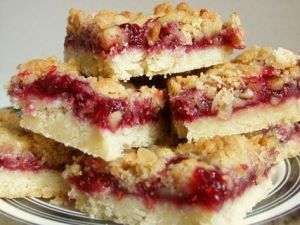 Fruit Squares is a divine dessert recipe with oats, coconut and jam. Mix dry ingredients together, then add juice. Stir just until moistened. Put slightly more than half of the crumb mixture in an oiled 5" x 7" baking dish and pat down. Spread fruit jam over this and top with remaining crust. Pat down slightly. Bake for 40 minutes.